I've had a few blog posts I've been planning on doing since the summer and am just getting caught up now. Sometimes, once I have time, I decide they're not blog-worthy, but Arctic Valley was a treasure that I look forward to going and visiting again. I was in Anchorage for four days in August, just hanging out, when I realized that the berries were ripening. A friend of mine told me years ago about picking berries on the slopes of Arctic Valley, and I'd passed the exit off the Glenn Highway just north of Anchorage many times with the resolution to go there someday. This was going to be that "someday", and I am glad I had plenty of time because it took awhile to get there. From the freeway exit, one passes a local golf course and then the pavement ends and the climb begins, up and up and up on a wide, rough, rutted gravel road. It seemed to go on forever, and I was sure I was in the wrong place going somewhere strange, when suddenly parking lots appeared and a valley opened up in front up me with a trail heading up the middle of it. There were only 2 cars in the parking lot, so I was uncertain this was a well-used place. 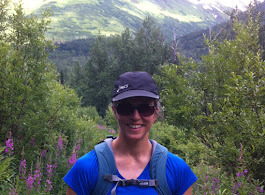 I took a side trail first, that led to nowhere, before heading up the valley, just exploring and scoping for berries. As the morning wore on, more and more folks showed up on the trail and there were plenty of cars in the parking lot by time I left. I only had enough time to get to the saddle at the head of the valley, overlooking Eagle River and Eagle River Valley on the other side before I had a commitment in town I needed to get back for. I realized that I'd hiked the area from the other side last year and the Arctic Valley trails connected with the Eagle River trails. Views of surrounding mountains are a feature of Arctic Valley, starting above treeline. There are a number of trails to explore here and many have moderate grades rather than the oxygen-depleting climbs of many mountains. Though there weren't any berries to speak of, it was still a gem of a discovery, being above treeline the whole time, a feature Alaskan's appreciate for being able to see bear from a ways off. I hadn't realized it was still an active downhill ski area, so I'll be mentioning this to my kids when they are home for the holidays as an alternative to the in town Hillside slopes. What caught my fancy was the history of the place, detailed on the interpretive signs. Tours are still available to see the Nike Hercules missile site where live test fires were conducted (see http://www.alaska.org/detail/nike-site-summit).